Lately, I’ve been making smaller things. It’s nice to sit down with yarn and hook and create something in one sitting–a bowl, a bag, a washcloth or two, etc. My sister’s birthday gave me a great opportunity to try out some small things I had been wanting to make (not pictured here…forgot to photograph them before I gave them to her). But this led me to other little things such as these. Felting is not really “my thing”…but I gave it a whirl with a few bowls (er, vases?). 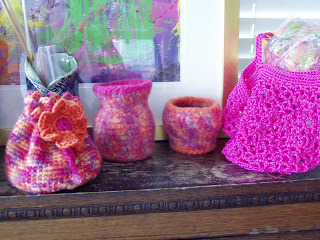 the pink “string” bag on the right is from Erika Knight’s book Simple Crochet. It turned out much smaller than I thought. My next will be larger so as to use at the grocery store. The string is from Lowe’s hardware–a durable nylon twine…fun to crochet with.